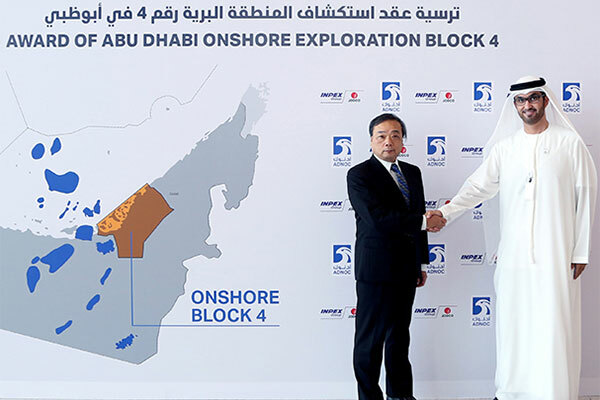 The Abu Dhabi National Oil Company (Adnoc), a leading global energy and petrochemicals group, has signed an agreement awarding the exploration rights for Abu Dhabi Onshore Block 4 to Japan’s Inpex Corporation. A wholly-owned Inpex subsidiary, Jodco Exploration Limited, will hold and manage the interest in the concession on behalf of Inpex. The award has been endorsed by Abu Dhabi’s Supreme Petroleum Council (SPC) and represents the deep commercial and economic relationship as well as long-standing energy partnership between the UAE and Japan. Inpex will hold a 100 per cent stake in the exploration phase, investing up to Dh646 million ($176 million), including a participation fee, to explore for and appraise oil and gas opportunities in the block that covers an onshore area of 6,116 sq km from Abu Dhabi city to the boundary with the Emirate of Dubai. Following exploration activities and appraisal of the existing discoveries, Inpex will have the opportunity to develop and produce any commercial discoveries. Adnoc has the option to hold a 60 percent stake in the production phase of the concession. The agreement, with a term of 35 years, was signed by Dr Sultan Ahmed Al Jaber, UAE Minister of State and Adnoc Group CEO, and Takayuki Ueda, president and CEO of Inpex Corporation. Dr Al Jaber said: “This award to Inpex is a further demonstration of how Adnoc is utilizing value-adding partnerships and new technologies to accelerate the exploration and development of Abu Dhabi’s substantial untapped hydrocarbon resources. It is an important part of our 2030 smart growth strategy, helping to ensure we stay ahead of the long-term increase in demand for energy and oil and gas products, further strengthening Abu Dhabi’s position as an essential energy provider to the world. Takayuki Ueda said: “Inpex positions Abu Dhabi as one of its core business areas, and we look forward to working in close cooperation with Adnoc to help it unlock value from Abu Dhabi’s substantial hydrocarbon resources while further expanding and strengthening our own business portfolio. Comprehensive health, safety and environmental impact assessments will be conducted ahead of operations to ensure any potential impacts of the exploration and development activities are mitigated to protect areas of environmental importance and reduce any disruption to the local communities, both through the operational approach and the technologies deployed. As well as drilling wells to appraise existing discoveries, the exploration phase will see Inpex leverage and contribute financially and technically to Adnoc’s mega seismic survey, which is already acquiring seismic data onshore and offshore within the block area. The survey is deploying industry-leading technologies to capture high-resolution 3D images of the complex geology up to 25,000 feet below the surface and will be used to identify potential hydrocarbon reservoirs. Ras Sadr-1, the first exploration well drilled in Abu Dhabi is located in Onshore Block 4. It was completed in April 1951 having reached a depth of 13,001 feet and was, at the time, the deepest oil well drilled in the Middle East. Inpex's involvement, through Jodco, in the oil and gas industry in Abu Dhabi started in 1973 with its participation in the Umm Shaif and the Lower Zakum fields. Jodco then joined in the development of three other offshore oil fields, the Upper Zakum field in 1977, Umm Al Dalkh in 1978 and Satah in 1980. In 2015, Inpex was awarded a 5 per cent interest in the Abu Dhabi Onshore Concession. Furthermore, in 2018, Inpex was awarded a 10 per cent interest in the new Lower Zakum offshore concession and, at the same time, also extended its 40 per cent stake in Satah and increased its stake in Umm Al Dalkh from 12 per cent to 40 per cent.